A Catechist embodies his or her faith in Jesus, the faith of the church, and imparts it to the student. 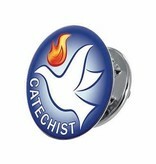 Responding to the call of Jesus, catechist teach by word and example, witnessing to the gospel, and building community. May the Holy Spirit anoint you for your work of helping others to encounter and accept Jesus, with both grace and good will..